Starplus 2803 is designed specially for today's hotel, motel, and resort applications. Your guests will appreciate the added convenience and simplicity provided by this Vodavi phone. This model includes highly visible red message wait lamp to alert guests of voice messages and an easy to access data port for computer connectivity. 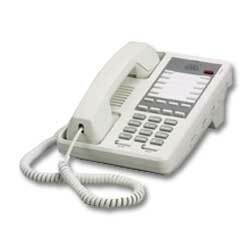 The two line functionality provides the added ability to simultaneously send and receive voice and data calls.